You’re not a maroon. You see a sweet sign-up bonus for a credit card. The bonus is yours if you get the new card and spend a thousand dollars or so in the next few months. AWESOME! But, $1,000?!! You realize it doesn’t make sense to waste $1,000 on stuff you don’t need, just to get a free plane ticket or points worth $500. What do you do? Use your new card for purchases where you’d normally use cash. Then pay off the new card with the cash you would have used in the first place. If you are afraid that you will use a card to spend money that you don’t have, I suggest signing in to your card account online and paying off the card balance from your linked checking account as frequently as you wish – even daily! $1,000 divided by three is only $333.33 per month or $11 per day. You can probably reach that spending requirement using your new card only paying the bills for your telephone, internet, cable and groceries. I use my credit card everywhere for everything – instead of cash. I use a card for any purchase I make online or in stores. Heck, I just used a card to buy a banana at 7-11. I use it EVERYWHERE possible. I don’t write checks. I don’t use a debit card. A credit card puts a firewall between my money and other people. 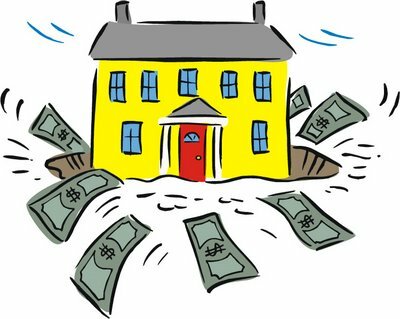 The only things I have not been able to pay with a credit card, without being charge a fee, are my mortgage, property tax and natural gas bills. Maybe you are like me. You’d rather not upset your system by involving another card. You already pay for everything with a credit card, and then pay the card off in full. Some of the bills are automatically charged to your credit card. Instead of getting 10 different recurring monthly bills, you get one credit card bill. Life’s easier this way! So, what do I do to meet spending requirements to get huge sign-up bonuses? I look for a big upcoming bill that will take care of the spending requirement in one fell swoop! My first stop is usually insurance (health, car, homeowners, umbrella). Next stop: dues to my union or other organization of some kind. Can you pay tuition with a card? HOA fees? Charitable Donations? I once got a new card that had a spending requirement of $5,000 in three months. I didn’t have any big bills coming up. So I decided to over pay my water and power bill – by $5,000.00! I met the new card’s spending requirement in one transaction that took 5 minutes of my life. The sign-up bonus was mine and this card’s spending requirement was off my brain. Of course doing this meant I had to have savings to pay off the card in full. If I didn’t pay off the card in full, the credit card interest would eat into the new card’s sign-up bonus. In case you are wondering, had I left that $5,000 in my checking account for three months, I would have received just over $10 interest. For me, passing up the $10 interest was worth not having to think about the spending requirement. Is time running out on your spending requirement window? 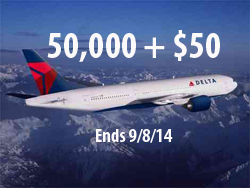 Let’s say you need to spend $500 in the next few days or you will miss out on the bonus. This is easy. 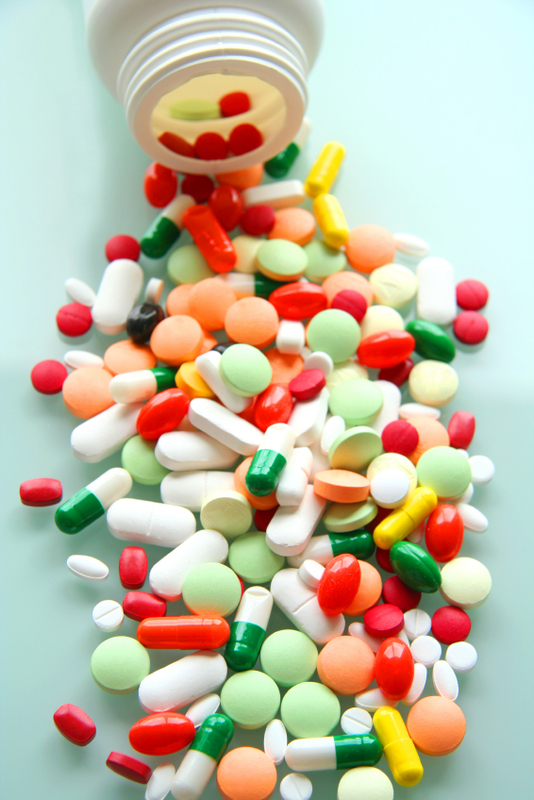 Head over to the Gift Card kiosk at your grocery store or pharmacy. Use your new credit card to buy a Visa/MC gift card. You will be charged a $4.95 or $5.95 purchase fee regardless of how much you put on the gift card. Load the gift card to the maximum $500 limit. In this example, your new credit card will be charged $504.95 or $505.95. You will have met the spending requirement on your new credit card and qualified for the sign up bonus! Essentially, you bought yourself some time. 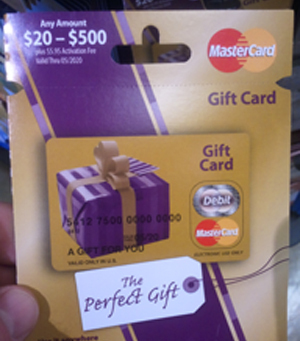 Now you have the $500 Visa/MC gift card that you can use at your leisure wherever Visa/MC are accepted. In effect, you extended the spending requirement period by using money (your new credit card) to buy money (your new Visa/MC gift card). The kiosks usually sell American Express gift cards as well. The Amex purchase fee is higher than Visa/MC and Amex is not as widely accepted as Visa/MC. So I suggest Visa/MC gift cards. As I wrote about in “Get Paid to Say Howdy to Store Greeters”, you can earn cash back by purchasing American Express gift cards through Big Crumbs, Ebates and TopCashback. In my example, I purchased $4,001 in gift cards and got 1.4% cash back or $56.01. Sweet! Free money!! The cash back rates change and are different at each site. 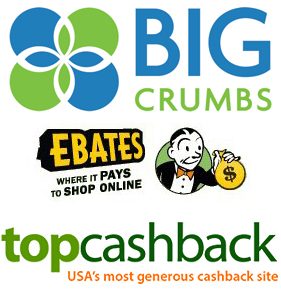 Today, it is Big Crumbs (1.8%), Ebates (1%) and TopCashback (2%). This is a combination of parts of the last three levels – plus getting cash back! 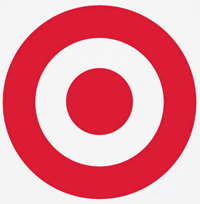 In “The Handy-Dandy Target Prepaid REDcard”, you will find out about this alternative bank account. You used to be able to fund it directly with a credit card. As of June 2015, there is another step you must take. You can sign into your REDcard account online. It’s just like online checking. You can pay bills with the money on your REDcard, send money to whomever (even yourself I suppose). You could also pay your rent and mortgage from your account. Pretty handy. Also at Amazon, you can buy Amazon e-gift cards. When I have needed to put a little activity on a credit card, I have purchased an Amazon e-gift card for myself. Moments after the purchase, I received an email saying that Chip Chinery bought me an e-gift card. I click the link and add that e-gift card to my Amazon balance for future use. Even easier: Sign in to Amazon. Under “Your Account” click “Your Account” in the drop down menu. In the “Amazon Wallet” section, click “View Gift Card Balance and Activity”. Then Click “Reload Your Balance” and use your credit card to do so. Just like how it made sense in #4 to pay a $5.95 purchase fee (which is 1.2% of $500) to secure the sign-up bonus, it may make sense to pay a higher convenience fee if you have no other choice. This is one of the last resorts that I would use to meet a spending requirement on a credit card. But it is there if you need it! As I wrote in “Is This a Smart Way to Pay Your Taxes?”, PayUSATax is the cheapest of the IRS approved payment websites. There is a 1.87% fee to use your credit card to pay your Federal Income Taxes. For every $1,000 paid, an $18.70 ladle of fees gets poured on top of what you pay. OfficialPayments.com accepts Federal, State, Local and Education payments for a fee. For example, I can pay my California state income taxes with a 2.3% fee. Charge Smart will allow you to use a Visa, MasterCard or Discover to pay various bills such as rent, mortgage, property taxes and car payments – for a fee. These are the bills I have never paid with a credit card because I don’t want to pay a fee. Again, it is here if you need it. At Charge Smart, I could pay my mortgage company, but I’d also have to pay a 2.8% fee. $1,000 of mortgage would cost me $1,028. WilliamPaid also lets you pay rent with a credit card, but charges a 2.95% transaction fee. In “A Solution for Tenants & Landlords” I wrote about how an individual can now accept payments with a credit card on their smartphone. At the time, Square had the best deal for these card readers. Its 2.75% swipe fee is competitive and the funds go in my account the next day. 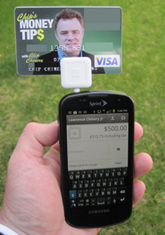 Intuit, PayPal and PayAnywhere are some other mobile credit card readers. You could talk your landlord into accepting your rent payment this way. If he uses the Amazon dongle, it will only run you 1.75%. This might be a good way to help meet a credit card spend, if you have exhausted options 1-7. You could also use PayPal to send money to anyone, but that fee is 2.9% + 30 cents per transaction. Some folks have credit card phobia. They don’t want anything to do with them. Or maybe they have horrible credit and don’t have a card. If one of those folks are your folks, or family or friend, you might offer to pay some of their large bills with your card, and have them pay you back with a check or cash. If this makes you want to get a card or two with huge sign-up bonuses, click on “Chip’s Favorite Credit Card Offers” at the top right side of this website for up-to-date deals, terms, and conditions on cards. Email me if you need help or have any questions.